Today, I started out painting two porcelains at front. I still have difficulty in creating three dimensional forms. These are not just round towards horizontally but also vertically. That's what I've found very tough. I was fiddling with details on two of them, but Greg got rid of them and helped me create big overall shapes. Then, I lightened up floor to differentiate from background, also to leave out darkest shadows. Greg put some more solid opaque colours on the yellow flower to attract more attention, and I did red paper wrap and yellow box. 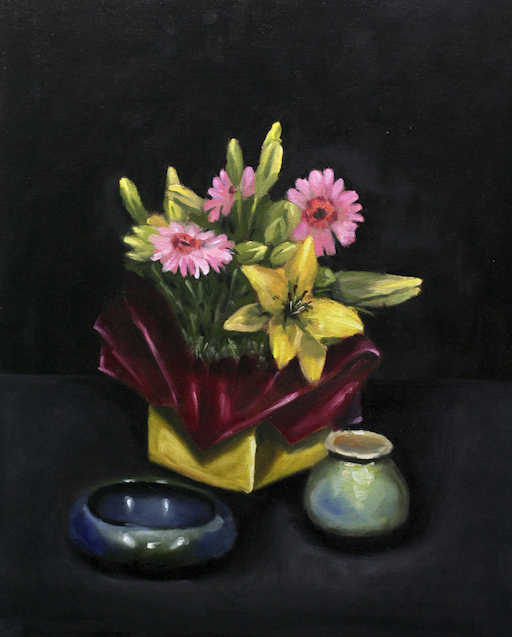 Floral subjects are big challenge for me, and I only had two lessons, but, I learned a lot from this painting, particularly how to do petals. We're going to have a summer break now. I really enjoyed Greg's teaching, and it's been a great privilege to learn from him. I'm looking forward to another year of painting with Gregory Smith!